Sorbus is a genus of about 100 species of deciduous trees and shrubs, widely distributed in temperate regions of the world, often found in woodland, on hills and mountains. Of all the Sorbus species, it is S. aucuparia, the Mountain Ash that is most commonly used for bonsai though there are other Sorbus species (or Mountain Ash) that would undoubtedly be equally suitable. For instance S. alnifolia (Korean Mountain Ash), S. americana (American Mountain Ash) and S. cashmiriana have very similar habits and cultivation requirements. Sorbus aucuparia, the Rowan or Mountain Ash is native to most parts of Europe and Asia where it can reach heights of up to 15metres. It is a broadly conical to rounded tree with a loose crown. Leaves are mid- to dark-green and display red and yellow Autumn colours. Pinnate leaves are oblong-lance shaped to 20cm long but consist of anything up to 12 small leaflets. 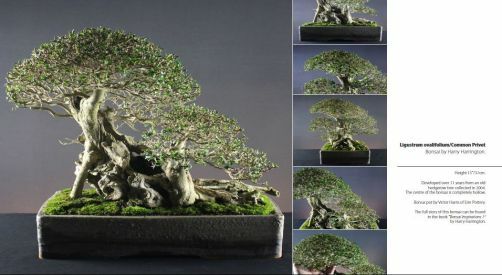 Leaves can be reduced to just 2 or 3 leaflets for the purpose of bonsai. In late-Spring, corymbs of unpleasent-smelling white flowers to 12cm across appear and these are followed by spherical red berries 8mm across that remain on the tree until late Winter. Bark is smooth, shiny grey though older trees sometimes develop dark-grey ridged bark. POSITION Full sun or partial shade. Frost protection required below -10°C. FEEDING Every two weeks for trees in training. Feed monthly in order to reduce leaf and leaflet size. REPOTTING Every one or two years as buds extend in Spring. Use basic soil mix. PRUNING Trim new shoots continually to maintain shape. Prune branches back hard in late-Winter. Reduce leaf size by removing leaflets to leave between 2 and 6. Prune hard at midsummer to encourage branching. PROPAGATION Sow seed outside in Autumn. Greenwood cuttings in early Summer. PESTS AND DISEASES Aphids, red spider mite, scale insects and fireblight. STYLING Suitable for all forms except formal upright and broom in all sizes.